Coffee, a sleeve, and the rest of a quiet day. I thought I'd share. I hope your Sunday morning is feeling this good. That yarn is too yummy. That's just like my Sunday morning too, except with tea and socks. Enjoy. The sleeve is beautiful. I am in love with that yarn! Thanks for sharing. My Sunday seems to be full of noise and commotion! Nice!!!! That's a wonderful Sunday morning. Mine was similar. Coffee in bed with my knitting. This photo sums up my morning as well... except I have a cat jumping on me every ten minutes because the yarn movement is too good to resist. This is weird. My morning was exactly the same. Sleeve'n'coffee - good combo! What kind of coffee are you having? I do love that yarn-it's a really crisp tweed. Lots of tweeds I'm looking at right now are kinda muddy, but that one has definition. I found this on Sunday night (I'm some miles east of you) but it's just as welcome. I've spent the day on a tweedy hat and a cotton sweater so I'm ready for anything. okay all over the world we are having coffee and knitting sleeves and in my case reading knitting around which i received yesterday. and in my case the sleeve is coffee brown rowan tweed. 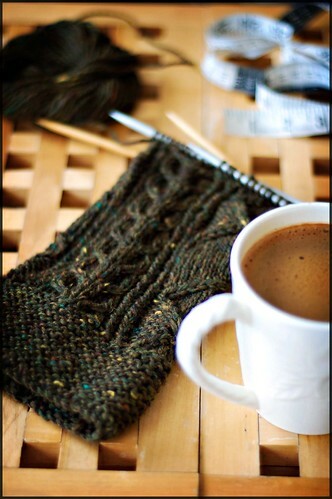 Coffee, sock knitting and blog reading--doesn't get better than that! Ahhhh! I wish my Sunday morning was like that! :) Not so much with two little ones underfoot. Beautiful picture! Every picture you take of that tweed sweater looks better than the last. Hope the rest of your week (and sweater) goes as great as your Sunday! Your pattern and the beautiful yarn is coming out so gorgeously! Oh, and wnjoying coffe a quite day sounds so great! It's what I long for. I think I haven't had one for year, due to small kids ... one 10 months and one 2 years and 4 months. Recommendation to you if/when you'll have your own ... Make sure you have someone near who can babysit every now and then ... if you can be without your small sweaties (I suspect thelast issue is my problem though). Great knitting! Sigh, don't know what looks better, the yarn or the coffee. That yarn is gorgeous! ah sunday... my favorite. this photo just sums up everything good about sunday for me. and so nice to see it on a cold monday morning... warming me up and bringing a bit of peace! p.s. 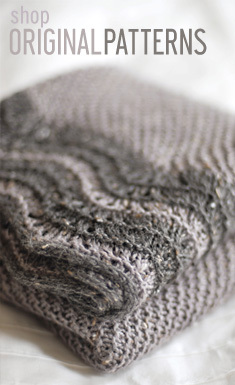 *thank you* so much for sharing your swatch/ design process with this sweater. 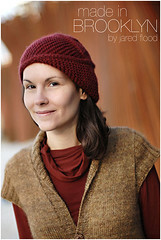 i really want to knit it and it has been wonderfully demystifying to read about the process! That looks like a perfect day. Pretty sleeve. What a delightful Sunday morning! Mine was spent in a rush trying to get ready for Boston's St. Patrick's Day parade. I could use a peaceful slow knitting morning like that! i love the blue flecks in the tweed. you always take such great pictures. I have just scheduled myself a Sunday like this, two weeks from now. Yesterday involved much cussing and fist-shaking as I re-edited Episode Four of Christa Knits (and still managed to publish it with a glitch in place). Thanks so much for letting me read your blog post about the swatch for this sweater - I've already heard good things back about this episode and its content, including your piece! The knitting is fab, and the coffee looks delicious. How do you brew? Gosh, love the cables and the yarn a perfect combination. I cannot wait to see the progress. Oh and love your photos, any tips? Is that a crema, by chance? That sweater is just gorgeous. The yarn is perfect for it. I'm a sucker for tweed. Got some off white tweed I need to knit with. Think it'll be cabled socks. I saw this and just had to comment- I've had coffee in several posts lately... always close to yarn I would hate to see with a coffee stain. It's my way of living dangerously... well, coffee is just my way of living... well, not really, but I'm a big coffee drinker.